Mouthwashes can contain 30 percent alcohol, which damages oral mucosa, significantly increasing esophageal, neck and oral cancer risk. Over 95 percent of Americans have gum disease, and it can be a killer. Though seldom lethal, mounting medical literature directly associates oral disease with extensive systemic problems, including leukemia, arthritis, heart, kidney, liver and lung diseases. “Cancer begins in the mouth,” says nutritionist Dr. Cass Ingram, a doctor of osteopathy and author of over 20 books. Healthy gums and teeth are systemic guardians. Infected, they are liabilities that heavily burden, poison and paralyze the entire immune system. Even minor imbalances can lead to systemic illness. For more information, read Ingram’s book, How to Eat Right and Live Longer. Routine brushing and flossing aren’t enough. Mouthwashes can contain 30 percent alcohol, which damages oral mucosa, significantly increasing esophageal, neck and oral cancer risk. 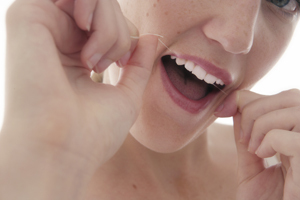 Regular dental exams and cleanings can loosen bacteria, allowing toxins into the bloodstream. This is why doctors recommend that heart-valve patients take antibiotics for dental work. Bone loss also plays a role in gum disease. Cornell University research finds that calcium is lost first from the jawbone. When shrinking bone pulls away from the teeth, inflamed gums, bleeding and loose teeth result. Low levels of calcium, phosphorus, zinc, vitamins A, D, K, C, bioflavonoids and riboflavin are all linked to gum disease. And while hormones also may be involved, folic acid and coenzyme Q-10 are absolutely vital and known to reverse receding gums. Nutrition and supplementation are key to correcting or preventing these problems. Replacing lost jawbone can be as simple as daily supplementation that includes 1,200 mg. calcium, 600 mg. magnesium, zinc (minimally 30 mg.), 500 IU vitamin D3, 10,000 mg. vitamin A and 500 mg. vitamin C. Bonuses can include lowered blood pressure and cholesterol levels. Additionally, 200 mg. niacin plus 50 mg. B-complex daily can bolster gum health. P-73 oregano oil can offer additional benefits to gums, as can all-natural mouth sprays that include the above nutrients and more. Julia Busch is president of Anti-Aging Press, Inc., editor of the So Young™ anti-aging holistic newsletter and author of 10 books. For a free in-depth report on nutrients to reverse gum disease and bone loss, leave your name and postal address at: 800-SO-YOUNG (800-769-6864) or julia2@gate.net.